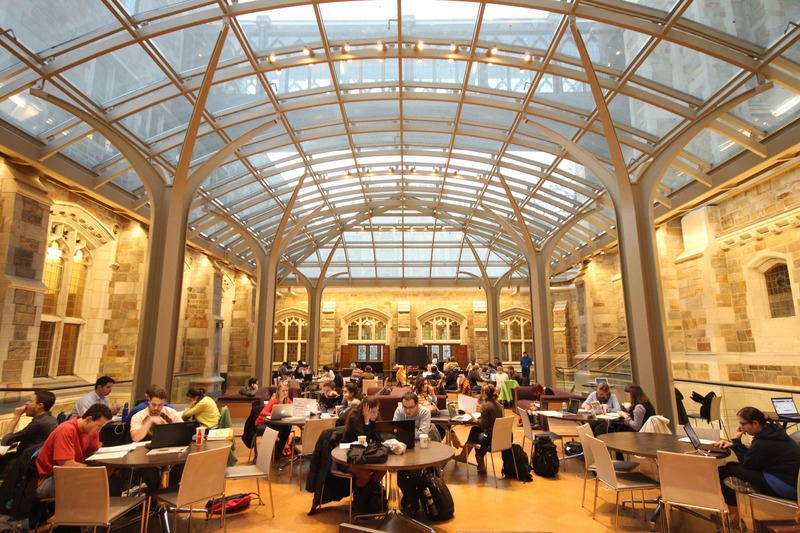 This article discusses how architects have chosen clear, fire rated glazing in school settings instead of traditional wired glass to meet safety and design goals. 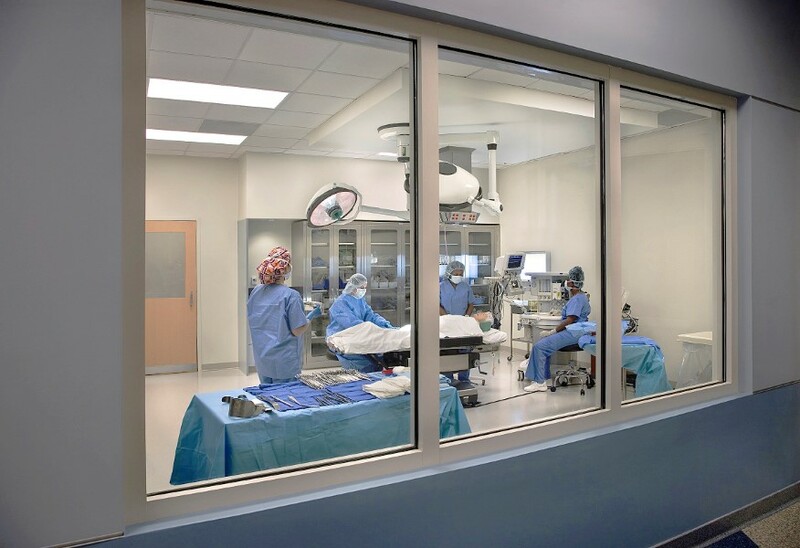 The use of glass throughout any building, especially a school, has an immediate impact on the people inside. By increasing visibility of the surrounding outdoors and the amount of natural light penetrating into the buildings interior, the general attitude, demeanor, and productivity of occupants can be greatly enhanced. But, what if the wall or door where you want glass happens to be a fire wall, an exit corridor or stairway or a fire barrier? Are there limits on the types and sizes of glazing you can use? The answer is yes. The good news is that in all but a few situations, there is a fire rated glazing product that offers a way to use glazing while protecting lives and property from fire. Below is an outside-to-inside tour of the top four places where codes affect glazing choices in schools. The IBC works to protect the spread of fire from building to building by defining horizontal separation distances and requiring fire-resistance ratings for building exteriors in close proximity. The IBC measures the building face to the closest interior lot line or to the centerline of a street, alley or public way. If there is more than one building on the same property and exposure protection is necessary, the IBC refers to an imaginary property line. The fire resistance rating for exterior walls is based on construction type, occupancy and fire separation distance as defined in Section 6 of the IBC. The fire resistance requirements range from no rating to 3 hours. Table 705.8 in 2012 IBC lays out the percentage of protected and unprotected openings and glazing size limits allowed in exterior walls. Fire protective glazing, such as glass ceramics, wired glass and specialty tempered glass, is either limited in size or prohibited altogether depending on fire separation distance. In general, as the fire separation distance increases, the allowable opening area and the percentage of allowable fire protection openings increases. Table 705.8 limitations do NOT apply to the use of fire resistive glazing materials tested as part of a wall assembly. Hutchins Hall and Student Commons Addition, University of Michigan Law School. Because construction of the new Student Commons was in close proximity to Hutchins Hall, all the historic stained-glass windows had to maintain a 2-hour fire rating. SAFTI FIRST helped the architects achieve the fire requirement while preserving the historic look by combining SuperLite II-XL 120 in EZ framing with the existing stained glass. The medical college is adjacent to a parking garage, which houses vehicles full of fuel. To protect the building exterior and meet codes, SAFTI FIRST supplied SuperLite II-XL 120 IGU in CW Framing. Serra Mesa Library, San Diego, California. 45-minute fire protective windows are permitted, but may not constitute more than 25% of the total wall area. To install glazing that comprises more than 25% of the total wall, the glazing must be 1-hour fire-resistive glazing, such as SuperLite II-XL 60. 20-minute fire doors with 20-minute vision panels (without hose stream) are permitted. Sidelites and transoms around a 20-minute fire door in a 1-hour exit require 45-minute fire rating with hose stream. Central Carolina Technical College, Sumter, South Carolina. SuperLite II-XL 60 in GPX framing was used in the openings in this 1-hour exit corridor because the total glass area exceeded 25% of the wall. The college needed extensive openings for observation. National Center for International Schools (NCIS), San Francisco, California. This 1-hour exit corridor used SuperLite I in the 20-minute rated doors, and Superlite I-XL in the 45-minute rated sidelites. NCIS selected SuperLite I-XL because it offers partial protection from radiant heat transfer and is more cost-effective when compared to filmed or laminated ceramic. A fire barrier wall is an internal partition subdividing a building to prevent the spread of fire and to create the first step in providing safe egress from a burning building. Fire barrier walls have a fire-resistance rating ranging from 1 to 4 hours, corresponding to the time in hours that the materials or assemblies can withstand fire in an established test. The 2012 IBC includes two tables that specify the door and window opening requirements for fire barriers and other fire wall structures. Table 716.5 specifies the door assembly rating requirements, including vision panel limits and sidelite/transom ratings. Table 716.6 provides fire window assembly rating requirements. 2-hour fire barriers require a 1-1/2-hour fire door with a maximum 100 sq. inch vision panel and a 2-hour fire resistive sidelite/transom. 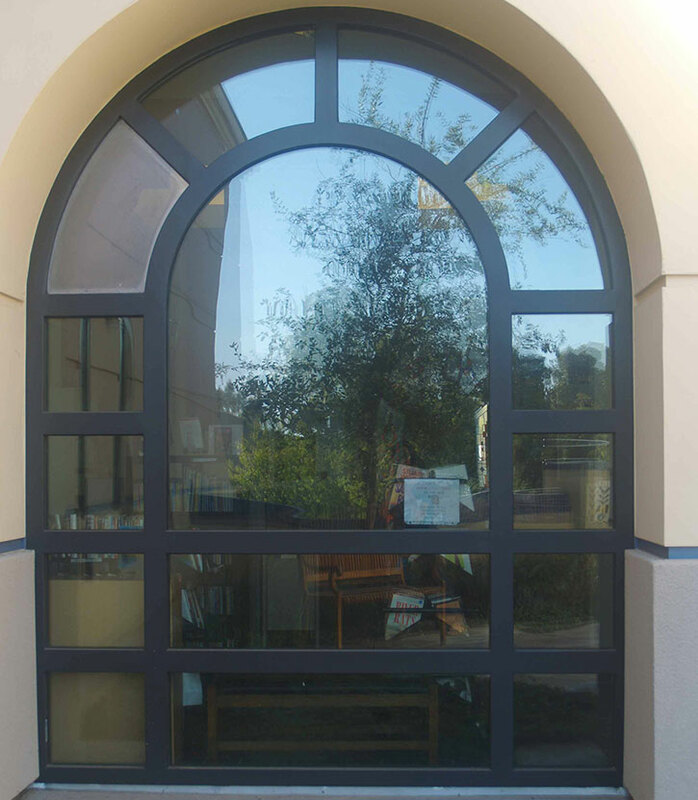 Click here to see code compliant glazing in and around a door in a 2-hour fire barrier. 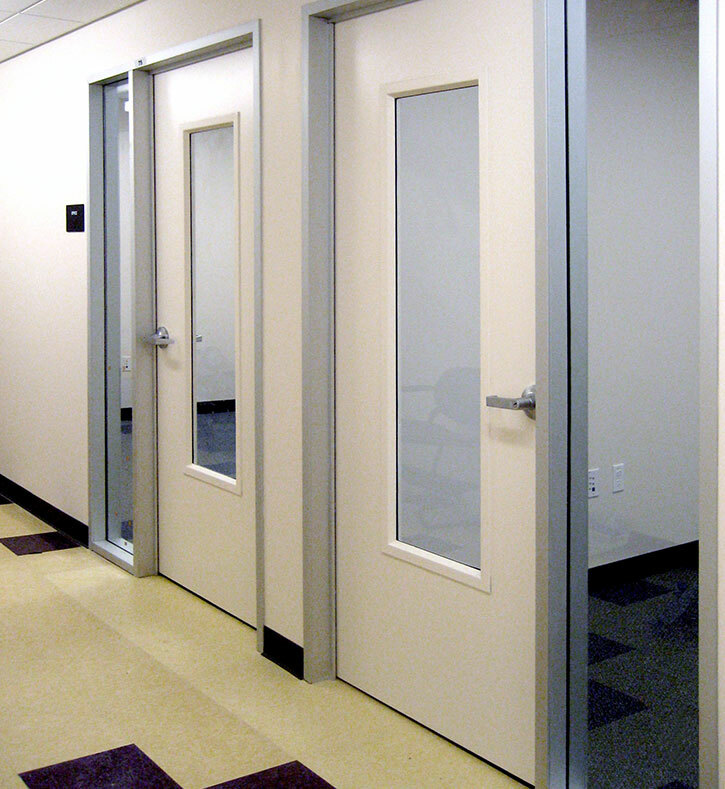 1-hour fire barriers used as exit enclosures require a 1-hour fire door with a maximum 100 sq. inch vison panel and 1-hour fire resistive sidelite/transom. 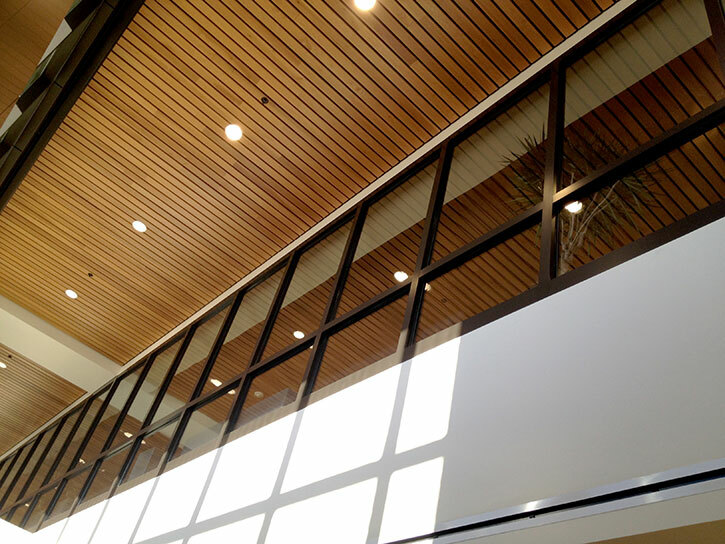 Click here to see code compliant glazing in a 1-hour fire barrier. 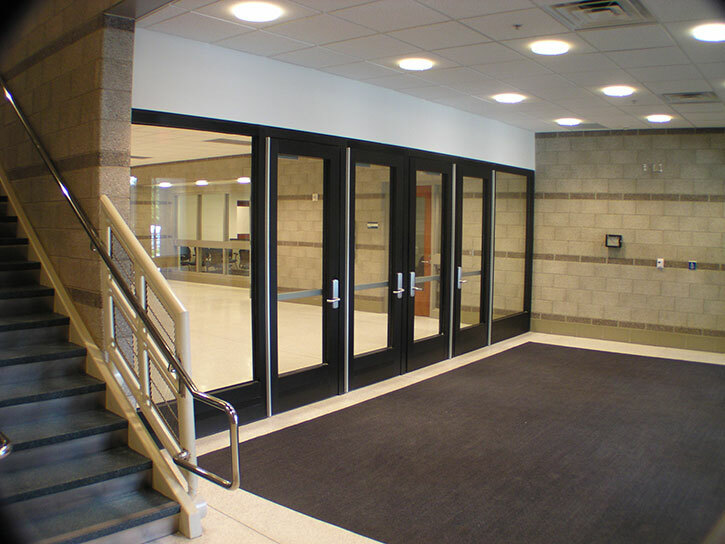 Fire resistive glazing vision panels in 1-and 2-hour fire doors are not limited to 100 sq. inches. Michigan Technical Education Center, Kalamazoo, Michigan. To meet the code requirements of this 1-hour fire barrier (photo on top), SAFTI FIRST supplied SuperLite II-XL 60 in GPX door framing and SuperLite II-XL 60 in GPX wall framing. Because the vision areas in the doors exceed 100 square inches and the architect wanted to incorporate glass in this application, fire-resistive ASTM E-119 rated SuperLite II-XL and GPX framing were used. Only fire resistive rated glazing assemblies tested to ASTM E-119 or UL 263 may be used in interior fire walls and fire barriers rated over 1-hour. 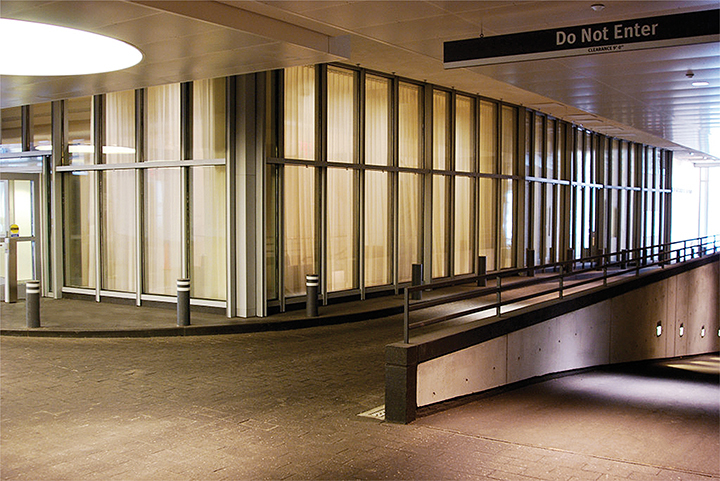 Fire protective (e.g., ceramic, wired glass) products are prohibited from use in 1-hour fire barriers used as exit enclosures or passageways. Fire protective (e.g., OH-45) products are allowed in 1-hour fire barriers only when the barrier is used as an incidental use area or mixed occupancy. Neuropsychiatric Institute, University of Utah, Salt Lake City. To enable natural light to penetrate further into the building while meeting the requirements of a 2-hour fire barrier wall, SAFTI FIRST supplied fire-resistive, ASTME-119 rated SuperLite II-XL 120 in GPX Framing.